3. Felts, Derrell Too Much Lovin' (Going On) [unissued] uniss. 4. Hanson, Jerry I'm Doing All Right [alt. vers.] [unissued] uniss. 5. Felts, Derrell Shake It Up And Move [unissued] uniss. 8. Johnson, Jimmy Don't Tell Me Your Troubles [unissued] uniss. 9. Johnson, Jimmy Five Days, Five Days [unissued] uniss. 12. Franks, Freddy Trying To Be My Baby [unissued] uniss. 13. Franks, Freddy Red Blue Jeans And A Pony Tail [unissued] uniss. 14. Johnson, Jimmy If You Don't Like My Peaches [unissued] uniss. 15. 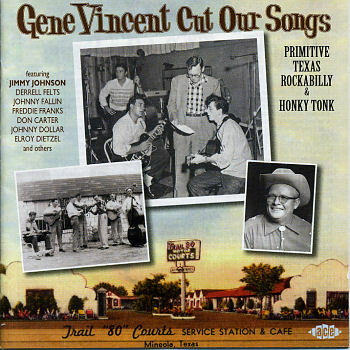 Johnson, Jimmy Too Many Honky Tonks [unissued] uniss. 16. Felts, Derrell Rock Saturday Night [unissued] uniss. 17. Johnson, Jimmy Slowly Going Crazy [unissued] uniss. 18. Johnson, Jimmy Sitting On The Doorstep [unissued] uniss. 19. Johnson, Jimmy Preview Of The Blues [unissued] uniss. 21. Fallin, Johnny Party Kiss [alt. vers.] [unissued] uniss. 22. Fallin, Johnny Cradle Rock [unissued] uniss. 23. Center, Bob Lost In The Jungle [unissued] uniss. 24. Unknown artist It's A Great Big Day [alt. vers.] [unissued] uniss. 26. Fallin, Johnny Long Haired Johnny [unissued] uniss. 28. Johnson, Jimmy Cigarettes And Coffee [unissued] uniss. 29. Carter, Don BI-Bickey-Bi, Bo-Bo-Boo [unissued] uniss.